This summer our meals are simple and light. Often our lunch comprises of wholesome and filling salad or one pot meals and loads of flavored buttermilk. Yesterday, I made a simple and delectable chicken curry for our mid day meal. 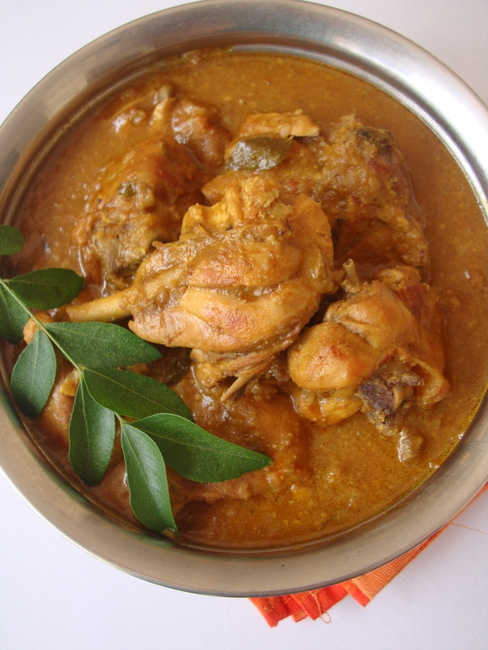 A regular Andhra chicken curry recipe with a slight twist. Cashew nut paste adds a touch of decadence, increases the flavor profile by leaps and bounds. 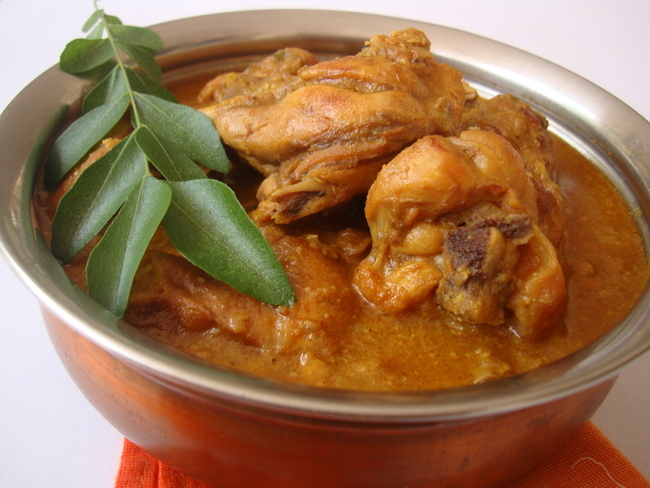 Its one of our favorite chicken curry recipes that goes well with flavored rice, plain cooked rice and rotis. Try it and I am sure it will be a regular fare in your kitchen as well. Heat oil in a heavy bottomed vessel, add the chopped onions and saute for 4 mts. Add ginger garlic paste and saute for 2 mts. Add the washed and drained chicken and cook on high heat for 4 mts. Reduce flame and cook the chicken for 5 mts. Add red chili powder, turmeric powder, coriander powder, cumin powder and kasuri methi and mix. Place lid and cook on low to medium flame for 8 mts. Add tomato puree and mix. Cook for 3 mts. Add 2 cups water and salt and place lid. Cook on medium flame for 20 mts. Add garam masala powder, cashew nut paste and curry leaves. Mix and cook without lid till you achieve the desired curry consistency. Turn off heat and remove to a serving bowl. Serve warm with rice or rotis. Kasuri methi is optional. If you do not have it on hand, add 1/2 tsp of dried mint/pudina leaves or coriander leaves. If you do not have ready made tomato puree on hand, make you own. Grind a large tomato to a fine paste and use it in place of store bought tomato puree. Tomato puree and cashew nut paste are essential for this recipe, so do not omit them. If you do not have curry leaves, omit them. Use fresh coriander leaves as a final garnish. By Sailu Published: April 16, 2012 This summer our meals are simple and light. Often our lunch comprises of wholesome and filling salad or one pot meals and loads of flavored buttermilk. Yesterday, I made a simple and delectable chicken curry for our mid day meal. chicken curry is fabulous dear…. I keep making a similar kind very usually at my house. The pictures are gorgeous! You always blow my mind with your neat presentation.. awesome..
Can curry powder be used in place of the curry leaf? Omit curry leaves. Use fresh coriander leaves or cilantro as a final garnish (about a tbsp of finely chopped coriander leaves will do). If you do not have coriander leaves, omit and follow the recipe sans any herbs. Thank you, good and easy. Very nice recipe Sailu garu – What garam masala have you used? Grind 20 gms cinnamon, 15 gms cardamom and 10 gms cloves to a fine powder. Remember to peel the cardamom and then grind. Place in an air tight container. It should last you a month or two. Use the cardamom peels while preparing tea. This looks good even to a vegetarian like me! This is great. I made it last night and it was amazing. My family was so delighted. Thanks for the recipe Sailu. Today I tried simple Chicken Curry. Every body liked it. Thank you for recipe. I’ve not tried cashew nuts on curry before, but I’ll try this one. Thanks for sharing this recipe! 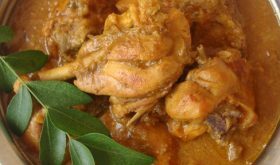 Its really easyn tasty recipe of delicious chicken curry……….today i tried it………believe me….chicken curry is ultimate………..Thanks for such a nice recipe.!! Is the Red chili powder the type of Chili powder that we have here in the states, or is that cayenne powder? Get the chili powder at an Indian store. The chili powder in America is Mexican chili powder which is more flavor than spicy. Big difference in both. I often cook various curries at home and quit going to restaurants. For a mellow, tasty and good chili powder I recommend looking for Deggi Mirch or Kashmiri Mirch. They are made from kashmiri kinds of chilies that are milder, but also impart a nice pleasant red color to dishes. Tried out the recipe and it really turned out well, it was yummy. Thank you for the recipe hope you would add more easy and tasty recipes.. Simple Chicken curry was gud to cook, but to make it better I had to add 2 TBSP Salt and Red Chilli powder……. Love your recipes….Tried this chicken curry,it was yummy.Taste was not simple it was mind blowing.Thank you for such an easy but delicious recipe. what can I substitute for the cashew nuts? almonds? I really want to make this today but don’t have cashews. I made this today! It came out very well. My super picky dh gave it the seal of approval as did ds! The caju give it a wonderful full flavor just as you promised. This one’s a keeper! Made this today.. It was awesome! Thanks Sailu! Simplest Chicken Recipe! After coming back from work, you are really not in a mood to stand in the kitchen for long. Thats when i tried this recipe…..and Voila! It was amazing. Thankyou Sailu ji. Instead of Garam Masala, try adding a 1tsp of chicken masala. Thanks…really helpful and simplified recipe. Very good recipe! Easy to make, “yummy!”, like my daughter said. Also easy to prepare and lovely consistency. Thanks for sharing. I always make this…it’s superb!!! no need to add water???? I have tried this recipe and it turned out well. It was yummy. Thanks for sharing. i add oil than onion than ginger garlic paste than tomato than chicken garam masala and other masala and than add chicken and than stir for a minute and add some water and close the lid of the cooker. than i wait for 2 whistle and than i turn off the gas and wait for 10minutes to cool off. is this correct method?